The United States Coast Pilot® (USCP) consists of a 9 volume series of nautical publications broken down by geographical areas of the United States. 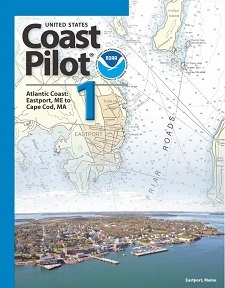 New editions of The U.S. Coast Pilot are published annually throughout the year. Also included in this book, is detailed information on the subjects of most concern to those of us who venture offshore. Information received by NOAA from various sources concerning depths, dangers, currents, facilities, and other topics, which has not been verified by Government surveys or inspections, is often included in the United States Coast Pilot; such unverified information is qualified as "reported," and while this information should not be ignored, it should be regarded with caution.